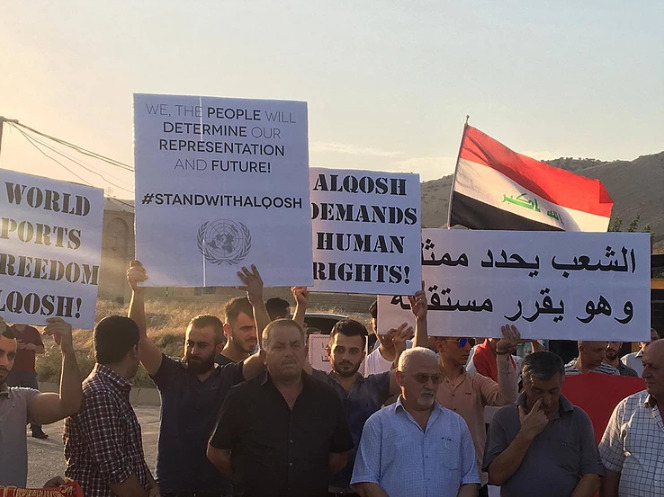 On 4 April 2019, the Assyrian Confederation of Europe published its 2018 Human Rights Report, entitled Struggling to Breathe: the Systemic Repression of Assyrians. The report identifies the significant threats posed to the existence of the Assyrian people in the Middle East, highlighting that the removal of ISIS from Assyrian-populated areas, while of critical importance, does not resolve the challenges that the Assyrian people face. Despite having ancient roots in the Middle East, Assyrians living in the area have struggled for survival in recent centuries. In addition to regular societal marginalisation and persecution, calamitous massacres have been carried out against this vulnerable minority community, from the 1915 Ottoman genocide (known as ܣܝܦܐ or Sefo, meaning ‘Sword,’ in Assyrian) to the brutal violence perpetrated by Daesh (ISIS) since 2011. These more recent atrocities have been recognised by the European Parliament as genocide perpetrated against a number of groups, including Assyrians. Hundreds of thousands have fled to Europe, North America, and elsewhere, seeking peaceful and prosperous lives. Now that Daesh is virtually defeated, Assyrians are confronted with other challenges. In 2018, they were targeted for political and cultural repression and were affected by ongoing regional violence. Across the Middle East, Assyrians are facing an existential crisis due to these continuous pressures. Vulnerable Assyrian communities are increasingly marginalised and disenfranchised. They are being slowly smothered by repressive systems. This is remarkably tragic in Iraq, where Christianity has long been a vital aspect of Iraqi culture and history and has been practiced by Assyrians for millennia. If Assyrians are to be wiped out in Iraq, it will mean the end of this ancient and venerated practice in the country.